The purpose of the renovation project is to build an inspiring working environment that exemplifies the values of the company. We aim to provide functions, efficiency, and interaction. Think of the space as a blooming tree. We work area at the center of the layout, as the stem of a tree. 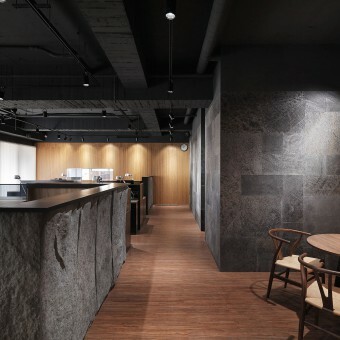 For our client who sees materials and texture the most important thing in the construction business, we took a simple approach of reflecting the nature of the materials in the space. 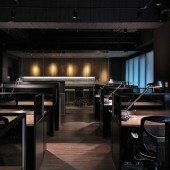 Calm and simple are the first image for the visitors, as for the staff, the individual work area is independent and sufficient for creative workers. Wooden lines grilles and columns are applied vertically throughout the space, to create a warm touch on the main theme of dark stone texture. Eca Headquarter Office Space by Gudc is a Nominee in Interior Space and Exhibition Design Category. · Click here to register today inorder to be able to view the profile and other works by GUDC when results are announced. Eca Headquarter Office Space by Gudc is Winner in Interior Space and Exhibition Design Category, 2017 - 2018. · Press Members: Login or Register to request an exclusive interview with GUDC. · Click here to register inorder to view the profile and other works by GUDC. Did you like Gudc's Interior Design? Did you like Eca Headquarter Office Space? Help us create a global awareness for good interior design worldwide. Show your support for Gudc, the creator of great interior design by gifting them a nomination ticket so that we could promote more of their great interior designs.